When former Gazette staffer Steve Campbell decided to set out and publish a magazine focused on the history, people and events of Prince Edward County some 42 years ago, he likely wasn’t thinking about records. But as Paul Adamthwaite, curator of The Victory Naval Marine Archive in Picton explains, Campbell is quite likely in a league of his own when it comes to continuous service to a title publication and for that, Prince Edward County history buffs and readers who enjoy an enthralling local yarn are much appreciative. 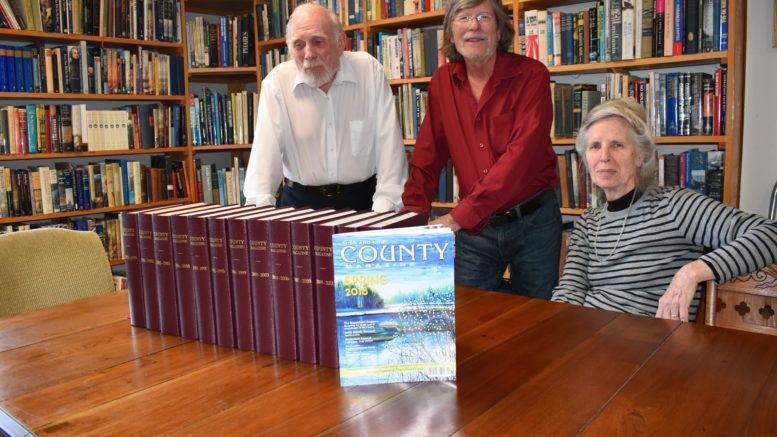 With the publisher and editor of County Magazine in attendance on Monday, the complete collection bound in glorious coverings, was unveiled at the local Archive at 205 Main Street in Picton. The complete collection from the debut edition to 1976 to the most recent 2017 fall edition have been completed and complied in bound volumes thanks to a $600 from the Municipal Community Grant Program which is managed through the Community Foundation. Since its inception in 1999, the Naval Marine Archive has collected County Magazine and worked diligently to complete the collection. The sixth edition published in 1977 was the last outstanding copy needed to complete the publication run to it’s current date. Eventually, a spare copy was finally discovered by Campbell recently, leading Adamthwaite to request and be granted funding to allow the binding of County Magazine. To find an entry of this quality in the Canadian Archives with the same editor of 42 years running would be impossible according to Adamthwaite and the set offers a great cross section of tales, stories and profiles told by a number of great local historians. Among the local literary legends that have shone a luminous light on past Prince Edward events include Archie Lamont, George Inrig, Phil Dodds, Dave Taylor, Giles Miramontes, Ian Robertson and Phil Ainsworth. While the back page has been Campbell’s humorous domain, the body of the magazine has been filed with carefully crafted submissions and the editor echoed Adamthwaite’s assertion. “All those contributors and all those kind and able authors and writers that gave so willingly of their work is what has kept us alive after all these years and what keeps people interested and picking up County Magazine,” Campbell added. The volumes will be located in the reference library in the local collection where the public can consult them when visiting The Victory. In other archive news, The Naval Marine Archive, The Canadian Collection and the Canadian Society of Marine Artists are proud to present the 35th Annual Exhibition of the Canadian Society of Marine Artists. This exhibition will be held at The Victory gallery, 205 Main Street, Picton, Ontario. The Verissage is Friday, the 4th of May 2018 from 4-7pm. New and exciting art marine art will be shown. The theme is The Romance of the Sea and artwork in various mediums including scrimshaw will be on display by many of well known signatory members, including John M. Horton, Ray Warren, Hamish Berchem, Peter Rindlisbacher, Alan Nakano, Lloyd Pretty, Stefan Starenkyj, Jean Leroux, George Wilkinson and guest artist Pim Sekeris.